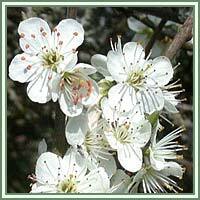 Habitat: Plum is native to Europe and Asia. It prefers full sun and wet soils. Description: Plum is a small tree, growing about 6 meters high. It has numerous, smooth and spreading branches and small leaves. The leaves are alternate, oval in shape, sometimes drawn to a point, slightly toothed. They vary in color, some varieties having bright green, and others dark green colored leaves. Flowers are organized in groups of 2 to 5 on short stems, and are small and white. Fruit appears when the tree is 3 to 4 years old, ripening from August to September. It is oblong in shape and brownish-black or deep violet in color. It has both sweet-mucilaginous and acid taste. 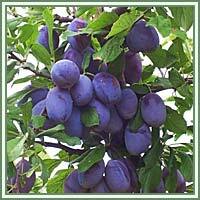 Medicinal use: Plum fruit is a febrifuge, laxative and stomachic. It is an excellent laxative for people with nervous bowel functions. Stewed with water, dried fruit can easily relieve constipation. Two of its compounds, amygdalin and prunasin combined with water form hydrocyanic acid, which acts (in small amounts, since it is otherwise poisonous) as a respiration stimulant, and can improve digestion.